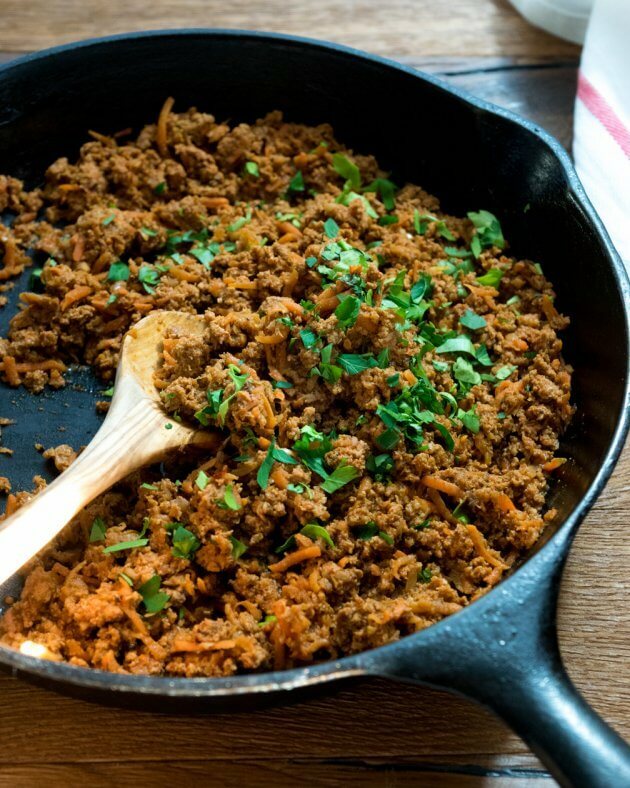 A quick and easy recipe for make ahead taco filling. This freezer recipe makes taco night a simple, healthy meal, the entire family loves to eat. When finished, you will have 3 batches of seasoned taco filling ready to freeze. Freezing the taco meat uncooked means the meal your cook later will taste freshly made rather than freezer burnt. 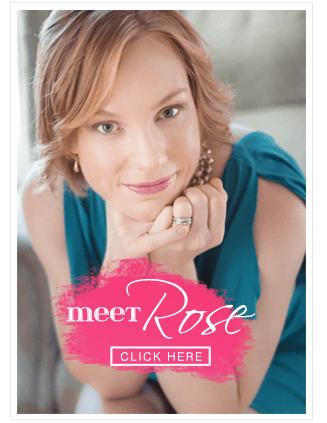 I am always looking for ways to increase the amount of healthy vegetables in our meals as well as add a few extra servings to create some leftovers. 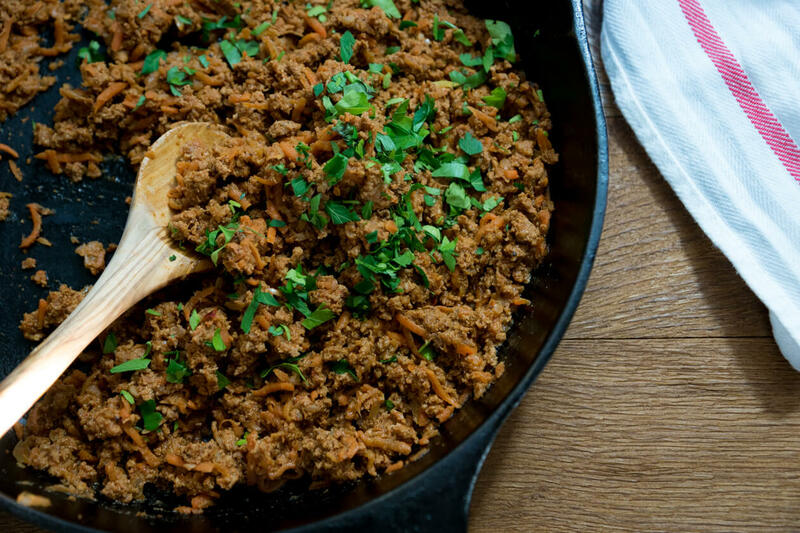 This taco filling recipe does both. Finely grated carrots and onions blends with the meat and sauce as they cook. Leaving nothing for the kids to pick out at the table. It’s a little miraculous really, thanks to the orange of the carrots blending with the red sauce and brown meat I haven’t had either kid dissect this dinner – yet. TIP: The finer the grate the better the camouflage. For the meat, I use either grass fed beef or lean ground turkey. Both are lower in fat so they won’t turn greasy during cooking. This makes them the perfect choice for make ahead recipes where all the ingredients will be cooked together. However, this also means they can turn out a bit dry. Adding grated vegetables is my favorite trick to keep the meat from drying out during cooking. The vegetables also add some richness to the flavor to the taco meat. Keeping a few batches of pre-seasoned and ready to cook taco meat in the freezer has saved me from less healthy dinner choices many times. Even on the busiest days I can have a healthy meal on the table in well under 30 minutes. Freezer meals make healthy eating a breeze! 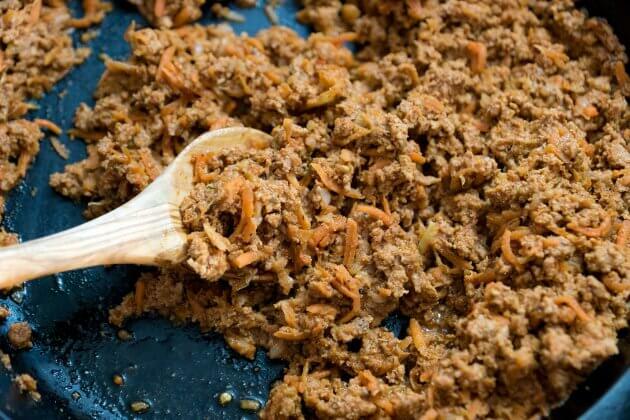 Prepare this healthy taco filling once then freeze for later. Use in favorite family recipes that include taco filling. Makes 3 batches with 6 servings each. Easily adjust the ingredient amounts to make more or less batches at a time. Place the meat, carrot, and onion in a large bowl, mix gently just enough to evenly combine. Set out 3 1-gallon size zip top freezer bags. Into each bag, pour 1 8-ounce can of sauce and 2 tablespoons seasoning with ⅓ of the meat and vegetable mixture. Gently push out as much air as possible then zip the bags closed. Label with the date and freeze until 1-2 days before ready to use. Allow the meat to thaw completely in the refrigerator before cooking. Heat 1 tablespoon of oil in a large skillet over medium high heat. Add the taco meat mixture and sauce then cook about 15 minutes until the sauce thickens and the meat has browned. Stir frequently. Add additional salt or taco seasoning to adjust the taste as desired. Serve with your favorite taco fixings, on top of a salad, or use in any recipe you would make with taco meat. To thaw quickly: Place 1 of the bags on a microwave safe plate with the bag open part way. Use the defrost setting on your microwave for 1 pound of ground beef or use a low power setting for 5 minutes at a time until thawed. Remove before the meat begins to cook. Immediately cook as directed above.